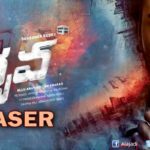 Nikhil, who won hearts with his last film Ekkadiki Pothavu Chinnavada, seems to have upped the thrill quotient as the teaser is anything to go by. Sudheer Varma, of Swamy Ra Ra, fame once again attempts a different film. This film teaser is unveiled by director Sukumar yesterday evening. Nikhil Siddhartha took his official twitter account and tweeted, We thank Brilliant Director Sukumar garu for his launching the teaser and inspiring our #Keshava team.Frm Aarya 2 NannakuPremato we lov u sir”. Nikhil is one of few actors in Tollywood who signing films with variety stories. After the watching Keshava teaser, we can say that Nikhil is back with yet another interesting experiment. Earlier, this young hero tasted back to back success with Swamy Ra Ra, Karthikeya, Surya vs Surya, and Ekkadiki Pothavu Chinnavada which was appreciated for its fresh theme and story line. It’s most refreshing trailer anyone had seen in 2017. In this Thriller, The Protagonist suffered from a serious heart-ailment. Still, He decides to take revenge on those people who messed his life.